What are pocket diapers like? There are many wonderful pocket diapers on the market. The top-name brands are Fuzzi Bunz and bumGenius, along with Happy Heiny's and many, many more. While the designs vary considerably, they are all fairly similar in form and function. They have an hourglass shape and a pocket opening from the front or back waist to stuff an insert through the pocket before use. The diapers cannot be used without an insert, and the insert must be pulled free of the diaper before washing. The shape and size of child each brand can provide a good fit for is quite different from brand to brand, and can greatly affect the ability of the diapers to keep wetness inside. The pocket allows the user to define how much absorbency they want, so the same diaper can be outfitted differently for day, nap-time and nighttime use. Because the insert is removed for washing, wash water is able to circulate fairly well throughout the parts to get them clean, but many makers provide inserts that have multiple layers of absorbent materials in them so not every layer is directly open to the wash water. The insert must be reinserted into the diaper before use. Most pocket diapers can not be put on by having a child step into them, so many users continue to require their toddler to lie down for diaper changes, which many children do not like. This type of diaper tends to have a "fluffy bottom" appearance on the child and can be difficult to fit under pants from many children's apparel companies, since clothes tend to be fitted over disposable diapers. So how do Antsy Pants™ compare to other pocket diapers? Antsy Pants™ combine pocket diapers' flexible range of absorbency with a number of modifications that make Antsy Pants ™ comfortable, easy to wash and easy to use, and perfectly suited to diapering your walking child. Antsy Pants™ are absorbent just the way they are; you don't need to add an insert or doubler unless you want to make them more absorbent for a heavy wetter, for longer wear-time, or for nighttime use. Antsy Pants™ pocket opening is along the side, not at the waist. This gives you total control over where you put an insert, should you need one. You don't have to shove your hand through the inside of each diaper to stuff inserts. Antsy Pants™ are designed so that every layer of fabric is open to unobstructed contact with the wash water to get the absolute best cleaning possible. You just flip them inside out as they go into the washer. You don't even need to unsnap the sides, so preparing diapers for the next use is super simple as well. Antsy Pants™ leg openings are shaped to come in close contact with your child's inner thighs without requiring tight elastic around the circumference of the thigh. This means a very good, leak-resistant fit without discomfort for your child. Antsy Pants™ convenient soft-stretch side panels conform easily to fit your child whether s/he has chubby legs or bird legs. 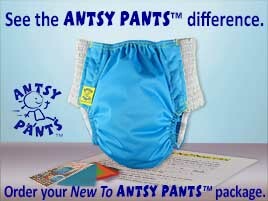 Antsy Pants™ are very trim, with no extra bulk on the sides of the diapers. They fit more like a disposable diaper, so they go under famous-maker clothing with no problem. Antsy Pants™ are designed specifically for toddlers, so you can change them on the go. Pull off over the feet, put the next one on the same way, over the feet. You always have the option to open the snap panels if you need to. Want to learn more about switching to cloth diapers for your toddler? Looking for a night diapering system? Learn how these top-quality cloth diapers came about. "I got the intro pack last week and loved it so much that I'm ordering some more. Thanks!" "Thanks for the antsy pants, my daughter loves them. I'm not battling with my 14 month old to put diapers on anymore. It's great!" "This has absolutely solved my nighttime heavy wetter issue...the Antsy Pants™ system is the only one that makes it consistently through the night – thank you!" Copyright 2009- all rights reserved.